The Cabrillo IT department will never ask for your email or password within an email. There may be shared Google documents on the Cabrillo intranet that require you to enter your Cabrillo credentials to view the document, but we will never ask you to share your credentials over an email. The only time you may be asked to tell IT staff your credentials will be when you have called in for trouble shooting assistance. I got an email that I suspect might be spam. What should I do? Do not click anything within the message. If you do click on anything within the email, do not enter your Cabrillo information into any boxes that may appear. If you are using Mozilla Thunderbird for your email client, there will be a small button reading "Junk" with a small flame on it. Clicking that will alert Thunderbird that the message is spam. 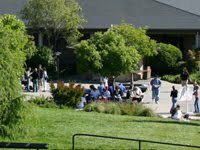 Cabrillo utilizes an email filtering system called Proofpoint. A more comprehensive FAQ can be found below in the main FAQ page, but for our purposes, please click here for more immediate Proofpoint help.